A black-clad enigma, “The Big O”, almost sinister behind his dark sunglasses. But when Roy Orbison started singing, the angels were listening. The dark, mysterious image came about by chance and does not mirror Roy’s personality at all, except that he was shy, very shy. But “the tall dark stranger”-persona lent a stunning air of mystery and loneliness to the mighty, powerful operatic voice and the abyss of sorrow and emotions it conveyed. Orbison picked the perfect vehicle for this combination of mystery and pain: complex, but beautiful pop melodies with dramatic climbs, wrapped in delicate choir voices and strings and played by a core of ace Nashville musicians. In the period from 1960-1965 there was nothing more lonely and beautiful around than the sound of Roy Orbison. He did not look the part at all, he was a big hunk of a man, almost clumsy in appearance, not strikingly handsome like other pop stars. But boy did he pour his heart out, he was the soft underbelly of masculinity, frightfully honest, way ahead of his time. Roy was unique, Roy was for real. He could make hearts cry. Roy was among the first artists who took charge of their own careers. He involved himself both in the production and the arrangements, he wrote many of the songs himself and also had the final say in the selection of cover songs. Although singles was his main priority, there was nothing slapdash about his LP’s. “In Dreams” was the last album he made before he discovered The Beatles (he toured with them in England in 1963). 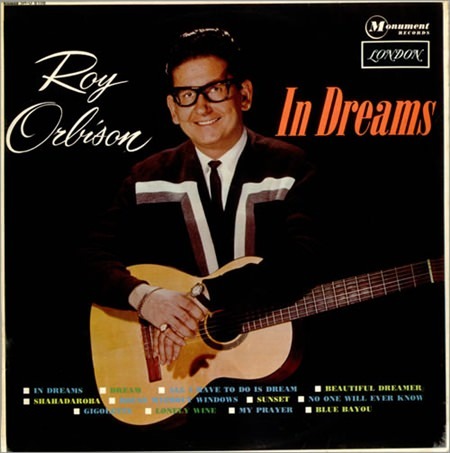 The remarkable title track (it never repeats a section; in two minutes and forty-eight seconds, it goes through seven movements with distinct melodies and chord progressions) was a huge hit, but its monumental place in the Roy Orbison discography did not come until 23 years later when David Lynch built his psycho thriller “Blue Velvet” around Roy’s re-recording of the song. The album also contains another hit, the soft and wonderfully deep blue tinted “Blue Bayou”. Orbison was only involved in writing four of the 12 tracks, but his voice and the way the music is built around it turns even the covers into Orbison-property. And that includes the Everly Brothers-chestnut “All I Have To Do Is Dream”. It is a mellow and polished record. But never sugar coated. Orbison’s voice puts a flickering flame of soul and identity into each and every track. These are songs sung by a man who has walked (and walks) the dark paths of life, he does not hide his pain, but achieves through the power and beauty of his voice to elevate the tormented darkness to something divine. There is always light at the end of the tunnel when Orbison sings. That light kept him going through personal tragedies that are simply impossible to grasp. In 1966 the love of his life, the unruly Claudette, died in a motorcycle accident. Three years later he lost his two eldest sons in a fire. Orbison truly walked the walk, and talked the talk, of a hero.